Community Water Harare has threatened to take Harare City Council to court over its decision to intensify water rationing despite some suburbs having gone for years without running water. This came to light when Zimre Park residents raised their voices against the decision by Harare city council to intensify water rationing despite having last got running tap water in 2013. 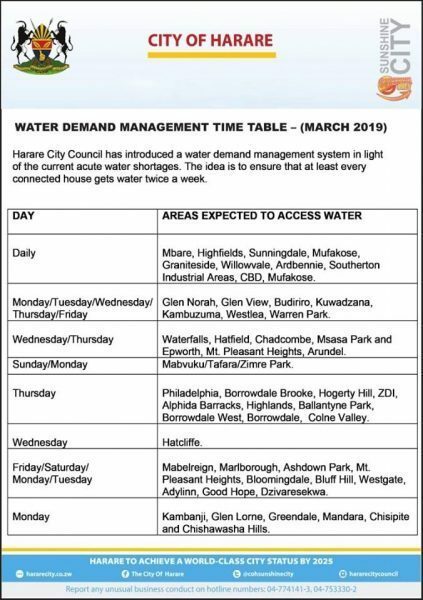 A fortnight ago, City of Harare introduced a water demand management system in line with the current acute water shortage. The idea was to ensure that at least every connected house gets water twice a week. Zimre Park was also part of the suburbs to receive water at least twice a week. In an interview with 263Chat, Community Water Harare spokesperson Hardlife Mudzingwa said the council is not really on the ground as they are not acting according to their schedule. “There are certain procedures that are in line with the constitution that need to be followed before releasing the water rationing schedule. As a result, they omitted some areas like Avondale and these areas don’t even know when they are going to access water.” Mudzingwa said. “The schedule also had its weaknesses, that is putting areas like Zimre Park on the schedule yet the suburb has not been accessing water for a long time now,” said Mudzingwa. “Areas like Zimre Park and Damafalls have not been accessing tap water hence they were forced to sink boreholes and other sources of ground water. This is a rainy season and a number of diseases are rampant during this time of the year. Ground water has been condemned following cholera and typhoid outbreak,” Mudzingwa added. “As an Association, we are waiting for the residents to come and collect their letters so that we can dialogue with the council. if we fail, then we can pursue the courts route because water is a basic right for the people,” said. Other residents also had something to say about the latest decision by Harare city council. “What pains me is that we are paying our dues but the council doesn’t even make an effort to meet our needs,” said one aggrieved resident. Other suburbs like Kuwadzana and Waterfalls are receiving water daily despite the water rationing schedule.